Dr Keith Stokes is Visiting Professor within Engineering and Physical Sciences at the University of Southampton. 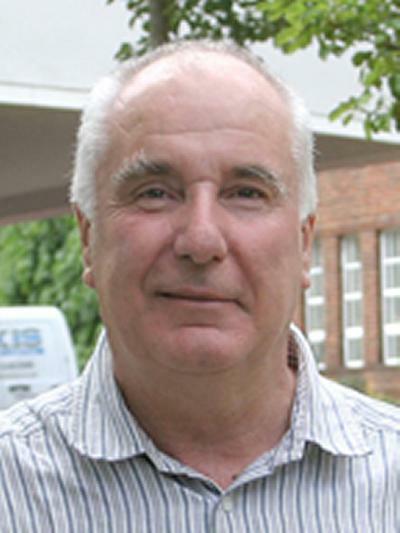 Keith Stokes, from dtsl, is a long term collaborator of Surface Engineering at the University of Southampton and instrumental to several high profile projects at nCATS (EDA, Microfluidics, High Strain Body Armour and others). The project focusses on the electrochemical properties and energy capability of the aluminium – air battery system. This comprises the separate half-cells, including the aluminium anode and its alloys as well as the cathode materials for oxygen reduction and the electrolytes with and without additives. The project propose the construction of a structural three dimensional battery and it is based on a PhD project currently in the final stages. It's more than just watching paint dry! Barik, R. C., Wharton, J. A., Wood, R. J. K., & Stokes, K. R. (Accepted/In press). Galvanic corrosion performance of high strength copper-nickel alloys in seawater. Journal of Corrosion Science and Engineering. Watson, S., Wang, L., Nie, M., Hinder, S., & Stokes, K. (2017). Polymer brushes for silicon nitride-steel contacts: a colloidal force microscopy study. Poster session presented at 72nd STLE Annual Meeting and Exhibition, Atlanta, United States. Watson, S., Wang, L., Nie, M., Hinder, S., & Stokes, K. (2017). Polymer brushes for silicon nitride-steel contacts: a colloidal force microscopy study. Paper presented at 72nd STLE Annual Meeting and Exhibition, Atlanta, United States. Watson, S., Wang, L., Nie, M., & Stokes, K. (2016). Development of polymer brushes for the lubrication of silicon nitride–steel contacts. Poster session presented at 71st STLE Annual Meeting and Exhibition, United States. Neodo, S., Nie, M., Wharton, J. A., Cranny, A., Harris, N., Wood, R. J. K., & Stokes, K. R. (Accepted/In press). Electrochemical detection of cupric ions with boron-doped diamond electrode for corrosion monitoring. Paper presented at EMCR2015: 11th International Symposium on Electrochemical Methods in Corrosion Research, Portugal. Nie, M., Wharton, J., & Stokes, K. (2015). Rapid manufacture of integrated self-powered sensing systems using additive manufacturing for critical structure health monitoring. Poster session presented at DSTL Advanced Manufacture Showcase, United Kingdom. Lewis, A. P., Cranny, A., Harris, N. R., Green, N. G., Wharton, J. A., Wood, R. J. K., & Stokes, K. R. (2012). Modelling the operational limits of a separation enhancement method for capillary electrophoresis: a designer’s tool. Poster session presented at The 26th European Conference on Solid-state Transducers (Eurosensors XXVI), Poland. Cranny, A., Harris, N., Lewis, A., Neodo, S., Nie, M., Stokes, K., ... Wood, R. (Accepted/In press). Microfluidic Devices for Structural Health Monitoring. Poster session presented at Marine Energy Systems Workshop Day, United Kingdom. Cranny, A., Harris, N., Lewis, A., Neodo, S., Nie, M., Stokes, K., ... Wood, R. (Accepted/In press). Microfluidic Devices for Structural Health Monitoring and Integrity. Poster session presented at Joint Academic Research Program for Defence, United Kingdom. Lewis, A., Cranny, A., Green, N., Nie, M., Wharton, J., Wood, R., ... Harris, N. (2010). Improving separation resolution of capillary electrophoresis to aid corrosion monitoring by dynamic control of the EOF. IMCS13, Australia. Cranny, A., Harris, N., Lewis, A., Nie, M., Wharton, J., Wood, R., & Stokes, K. (2010). Lifetime performance characteristics of screen-printed potentiometric Ag/AgCl chloride sensors. APCOT2010, Australia. Lewis, A., Cranny, A., Green, N., Nie, M., Wharton, J., Wood, R., ... Harris, N. (2010). Novel fabrication method for rapid creation of channels using PDMS for microfluidic networks on planar substrates. Poster session presented at APCOT2010, Australia. Cranny, A., Harris, N., Lewis, A., Nie, M., Wharton, J., Wood, R., & Stokes, K. (2010). Screen-printed platinum electrodes for measuring crevice corrosion: Nickel aluminium bronze as an example. IMCS13, Australia. Cranny, A., Harris, N., Lewis, A., Nie, M., Wharton, J., Wood, R., & Stokes, K. (2010). Screen-printed platinum electrodes for the detection of cupric and ferric ions in high chloride backgrounds. Poster session presented at APCOT2010, Australia. Chambers, L. D., Wood, R. J. K., Walsh, F. C., & Stokes, K. R. (2008). Biomimetic inspired marine antifouling coating system assessed using electrochemical techniques. Paper presented at Materials Research Society. Symposium DD: From Biological Materials to Biomimetic Material Synthesis, . Chambers, L. D., Helio, C., Stokes, K. R., Walsh, F. C., & Wood, R. J. K. (2008). Practical aspects of developing a natural product based marine antifouling coating system. Paper presented at 14th International Congress on Marine Corrosion and Fouling, . Chambers, L. D., Walsh, F. C., Wood, R. J. K., & Stokes, K. R. (2007). Natural products as antifoulants in marine surface coatings. Paper presented at NASM 2007: Novel Applications for Surface Modifications, . Chambers, L. D., Wood, R. J. K., Walsh, F. C., & Stokes, K. R. (2007). Natural products for antifouling coatings. Paper presented at Marine Corrosion Forum, . Chambers, L. D., Walsh, F. C., Wood, R. J. K., & Stokes, K. R. (2006). Biomimetic approach to the design of the marine antifouling coatings. In World Maritime Technology Conference. Maritime innovation - delivering global solutions (Conference proceedings of the Institute of Marine Engineering, Science and Technology). London, UK: Institute of Marine Engineering, Science and Technology. Barik, R., Wharton, J. A., Wood, R. J. K., & Stokes, K. R. (2004). The environment factors affecting the performance of nickel-aluminum bronze (NAB). 1-14. Paper presented at Corrosion 2004, . Barik, R. C., Wharton, J. A., Wood, R. J. K., Tan, K. S., & Stokes, K. R. (2003). Erosion and erosion-corrosion performance of cast and thermally sprayed nickel-aluminium bronze. 17-17. Paper presented at RTO AVT Specialists’ Meeting on “The Control and Reduction of Wear in Military Platforms”, . Tan, K. S., Wood, R. J. K., Wharton, J. A., & Stokes, K. R. (2002). Electrochemical investigation of high velocity oxy-fuel (HVOF) aluminum bronze coatings under slurry erosion in saline environments. Paper presented at Corrosion 2002, . Speyer, A. J., Wood, R. J. K., Stokes, K. R., & Sturgeon, A. J. (2000). Corrosion of aluminium based coatings for use in marine pipework. In EUROCORR 2000 UK: Institute of Materials. Tan, K. S., Wood, R. J. K., Wharton, J. A., & Stokes, K. R. (2000). Electrochemical investigation of high velocity oxy-fuel (HVOF) aluminium bronze coatings under slurry erosion in saline environments. In Proceedings of 6th Postgraduate Conference in Engineering Materials Southampton, UK: University of Southampton.